Barbara "Barbie" Millicent Roberts, an 11.5" tall plastic doll with a voluptuous female body supposedly from the fictional town of Willows, Wisconsin, debuted at the International Toy Fair in 1959 to mixed reviews. Doll buyers thought she was too mature and many refused to stock the doll in their stores. Generally mothers agreed, but for their daughters it was love at first sight. Since Mattel, Inc. sold over 350,000 of the $3 doll in its first year, the daughters had had the final word. 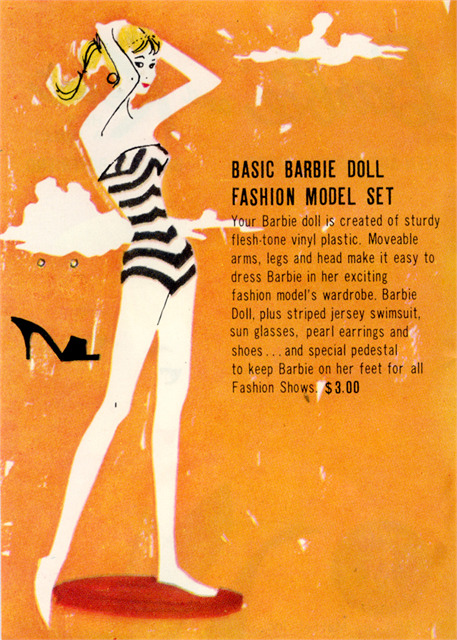 Described as an older teenage girl "created of sturdy flesh-tone vinyl plastic," Barbie came in a black and white striped strapless swimsuit, sunglasses, earrings, and stiletto-heeled shoes. Orville and Frances Fox of Oshkosh purchased this original Barbie, along with a carrying case and lots of clothes, for their granddaughter Beth Fox of Madison to play with when she came to visit them at their home. 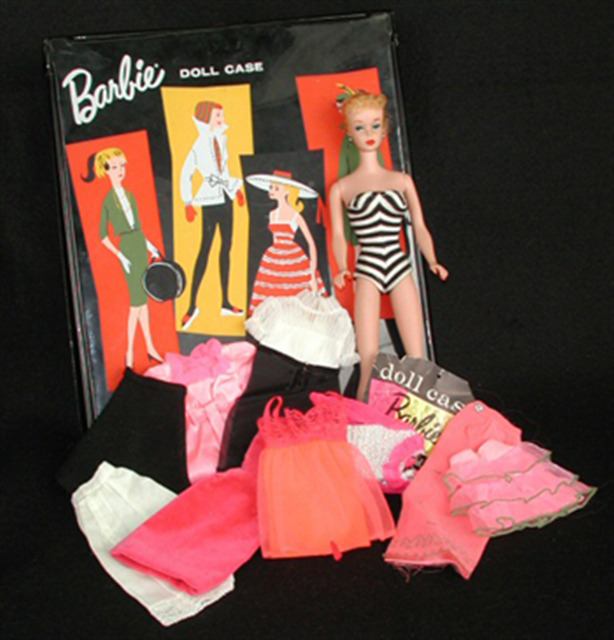 "Barbie" was the brainchild of Ruth Handler. 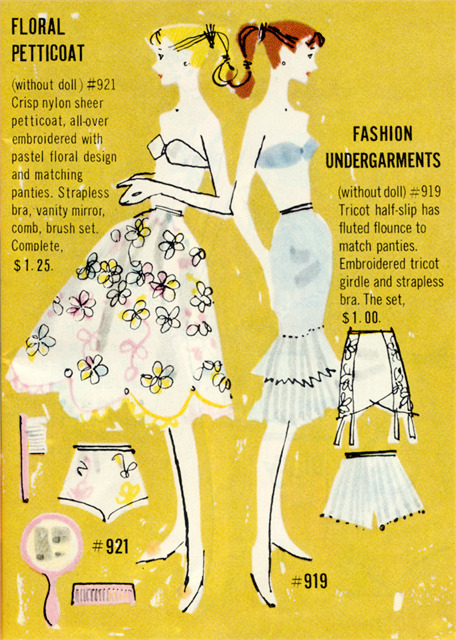 In the early 1950s after noticing her daughter preferred playing with adult women paper dolls rather than ones representing children, Ruth realized that there was no real three-dimensional doll equivalent. Most dolls at that time were in the form of babies and young children. Handler believed girls wanted to dream about being grown up and dressing in fashionable clothes. Unlike other mothers she was in a great position to do something about her observation. In 1944 her husband Elliot Handler and a friend Harold "Matt" Matson had created Mattel Inc. to sell picture frames. Within a year they were selling plastic doll furniture and by 1947 considered themselves in the toy business. By the early 1950s Mattel had already become "a big business" in the toy world. They planned to move into the doll market, but wanted their doll to make a splash. Ruth pitched the idea of an adult female doll with toenail and fingernail polish and great clothes to her husband and other company executives, but the concept made them squirm, especially the fact the doll would have a bosom, and they passed on it. On a trip to Switzerland in the summer of 1956, Ruth saw a doll in a Lucerne shop window that represented exactly what she had conceived of in her mind's eye. The Lilli doll, based on a cartoon in the "Bild Zeitung "newspaper, had long legs, a full bosom, and a coy look. Ruth bought several of them to bring back to the States, completely unaware that these dolls were considered a toy for adult men and were a hit at bachelor parties in Europe. When she showed the doll to Mattel executives, they still had a squeamish reaction to it, but Ruth's strong personality and steadfast belief in the doll eventually convinced them. In the end Barbie, named after Ruth and Elliot's daughter Barbara, was a toned-down version of Lilli, but she still had blond hair, a sideways glance, unusually long legs, and breasts. Over the next ten years other dolls were added to the line, first Ken, named after the Handlers' son, followed by Midge, Allan, P.J., Stacey, and Christie, the first African American Barbie doll. 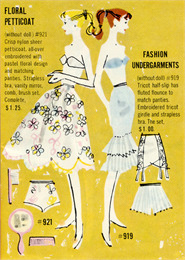 In 1971 Barbie's look changed to the more familiar Barbie of today. Her face was softened and rounded, she looked straight ahead, and she smiled! Over the years Barbie's popularity has soared, making her an American icon. Along with the popularity, however, have come some negative reviews. To many Barbie represents the negative side of America's consumer culture, since her foremost concern appears to be acquiring more "stuff," whether clothes, jewelry, houses, or cars. These critics feel Barbie teaches young girls only to become dutiful consumers. Feminists have derided her impossible body (38"-18"-33") and the emphasis on her bombshell looks, despite the fact Mattel has given Barbie a number of careers including nurse, astronaut, and army officer. 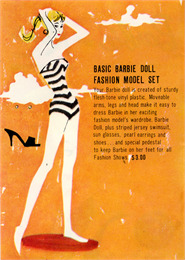 In Barbie's defense, Ruth Handler argued that Barbie has always maintained her independence. She has never gotten married or had children, although she has a slew of wedding dresses, and has followed her career dreams, all the while maintaining her femininity. In Ruth's mind she was the embodiment of the modern American woman.